Listed as Least Concern by the International Union for the Conservation of Nature (IUCN), the Kob belongs to the Animalia Kingdom, Chordata Phylum, Mammalia class, Artiodactyla Class, Bovidae family, Reduncinae Sub family, Kobus genus and Kobus kob Species. The Kob antelope is spread to the parts of Sub Saharan Africa stretching from South Sudan to Senegal including Uganda where it is always encountered on Uganda safaris. Greatly found along the northern savannah, the Kob antelope is greatly encountered in the Uganda safari parks of Murchison Falls and Queen Elizabeth, the Congo’s Virunga and Garamba National Parks and the flood grassy plains of South Sudan. The Kob antelopes are majorly found in the wet areas including the flood plains where they always consume grasses. They have a patchy distribution from the west of Africa to the Central East Africa inhabiting flat areas with open landscape that is close to permanent water featuring a reliable climate. The Kobs enjoys fresh grazing and daily drinking. They normally occupy short grasses in the rainy season and try to keep them short. It can be noted that since they are water dependent, the Kobs can hardly wander to distant dry lands. The Kob antelopes tend to move from one pasture to the other according to the changes in seasons. In the flooded areas, the Kobs can transfer for a range of Kilometers counting to a hundreds while in the dry spells; they normally wander in a range of 10km to the water point. The Kobs tend to prefer grazing on Hyparrhenia species, Setaria gayanus, Brachiaria brizantha, Chloris gayana, Digitaria spp and Echinochloa as always seen on safaris in Uganda. In East Africa, the Ugandan Kob also referred to as Kobus Kob thomasi features on the Ugandan Coat of Arms while the white-eared Kobs also referred to as Kobus kob leucotis is spread in the parts of South Sudan, the south west of Ethiopia and the far north east of Uganda and tend to involve in migrations on a large scale. 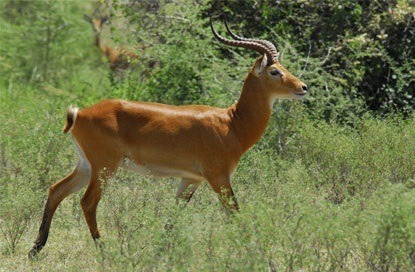 Regarding the physical description, the Kob looks like the Impala antelope but it is more robust. The males are more robust than the females and they feature horns. The Male Kobs feature a shoulder height of 90 – 100cm and tend to carry an average weight of 94kg whereas the females feature the shoulder height of 82 – 92cm and carry an average weight of 63kg. The Kob’s pelage tends to be golden to reddish brown but with a patch on the throat, eye ring, white inner ear and black front at the fore legs. It can be noted that males get darker as they older while for the white eared Kobs spread in the Sudan region feature different and generally dark pelage that is close to that of the Nile lechwe. The female and male Kobs feature well developed inguinal glands which secrets a waxy yellow substance along with preorbital glands. Regarding the social behavior, it can be noted that Kobs are diurnal species but tend to be considerably inactive during the heat of the day. The Kobs thrive in groups comprised of either calves, females or only males and these can range from five (5) to forty (40) animals. The Kob antelope features few strong social bonds but it can be noted that female Kobs can thrive even in herds of thousands. The females tend to be social than the territorial males. The females are always on the lead for the daily water search. The young ones get to know where to go from their mothers. The Male Kobs always exist in the migrating herds and would follow the females. The male herds numbering to hundreds tend to accompany the females as they move in the dry seasons. It can be noted that the reproductive and social organization of the Kobs may vary. The males in low population groups tend to establish conventional territories and rarely travel much and the male would attempt to establish their territory in the best habitat available and its herd comprises of females along with their young. The young males which are non-territorial thrive in bachelor groups which are excluded from the females by the territorial males. In the flood plains where there is always dense population of Kobs, the 2/3 of the territorial males attempt to form traditional territories whereas the rest thrive in clustered territories which are referred to as Leks. It can be noted that the clusters tend to be smaller than the traditional territories and the leks are normally located on the short grass patches or bare ground within relatively tall grassland. The 9 out of 10 females go to the leks for mating. The conflicts among the Ugandan Kobs which are territorial are normally settled with ritual and with little fighting whether in leks or conventional territories. The male walk in an elect posture drawing closer to an intruder to stop him and this is done also by the adjacent males in the leks when they reach their borders. For the lek holding white eared Kobs, there is a lot of fighting. Fighting resulting into fatal injuries can occur when the territory control is at stake. The fighting encounter involves the combatants clashing, twisting and pressing each other with their horns head on. However, it can be noted that the neighbor can attack from either the side or rear. In the lek clusters, the males with dominance will occupy the center and the number of males in the center tends to be in a range of 3 – 7. They monopolize copulations with the females in estrous. The male replacement in the clusters is common compared to traditional territories and as a result males can be able to stay at the center for a day, two and hardly a week. The competition is always high as a range of males tends to come from the territories to drink and feed. The center located males are deprived of food and thus opt to get out of the lek to feed and get some energy after which it comes back to compete. The males in the traditional territories tend to reign for one year or two. The female Kobs undertake their first ovulation at 13 – 14 months old and feature 20 – 26 day interval in the estrous cycles until they are fertilized. The traditional territory males keep the females in their territories but in leks, the males rely on advertising themselves as they cannot manage herding the females. The courtship in Kobs tends to last about two (2) minutes while the copulation lasts about few seconds. The female in leks can mate close to 20 times a day with one of the central males in a day. Following the gestation period of eight months, and birth giving, the estrous tend to commence 21 – 64 days later. The calves tend to hide in the dense vegetation in the first month and the mother and the calf can identify their mothers using their noses. The calves gather in crèches as they grow old and the mothers stay with them for 6 – 7 months the period they are weaned. They are part of female herds when they are young and when they mature the males enter the into bachelor groups. Regarding Conservation, the Kob numbers have suffered from human development and hunting and in fact the Ugandan Kob is noted to have got extinct in the parts of north western Tanzania and south western Kenya as a result of habitat loss. However, considerable populations of Uganda Kobs can be found in Uganda and Congo and seen on safari in Uganda.